Am back with yet another review from the brand, Juicy Chemistry. I am seriously in love with this brand nowadays and I would recommend it to everyone to try some of their products. Nowadays, there are many natural, organic brands in the market – Aroma Magic, The Nature’s Co, Votre, Bon Organics, etc. Usually when people shift to natural brands, the main issue they face is that natural products take longer time to show results than the regular ones. When people don’t see results soon, they give up and move back. But Juicy Chemistry is one brand whose products show effects quickly. The reason being that they have a higher concentration of natural ingredients, zero fillers and they use only pure, organic butters, oils and herbs. After having a wonderful experience with Juicy Chemistry Prickly Pear & Tamanu Under Eye Serum, I was looking forward to using this eye cream also. So let’s see how Juicy Chemistry Organic Coffee & Green Tea Eye Cream performs. Meanwhile you can check out reviews of all Juicy Chemistry products here. Too many late nights? Looking like a raccoon lately? Give your eyes some TLC with this under-eye cream infused with Coffee and Green Tea. Rich in Vitamin K, Almond oil reduces puffy bags under the eyes and dark circles. Carotene and Vitamin A loaded Carrot Seed oil moisturises the area and prevents lines and wrinkles. Go on, try it and throw away that concealer! Hydrate and repair the delicate under eye area with our nourishing cream. Formulated with a blend of nutrient rich oils and therapeutic essential oils, it helps control under eye puffiness and dark circles. Rich in anti-oxidants and essential oils, Green Tea and Coffee do more than just wake up your skin. Coffee infused almond oil reduces the damage caused by environmental aggressors, reduces signs of ageing and improves skin’s elasticity. The light oil is easily absorbed and nourishes the skin from within. Green Tea infused Jojoba oil moisturizes deeply, soothes irritated skin and helps reduce dark circles. Vitamin E helps reduce wrinkles and dark circles due to its rich antioxidant properties. It helps lessen under eye puffiness that makes the circles more prominent. Carotene and Vitamin A loaded Carrot Seed oil moisturises the area and prevents lines and wrinkles. Clove and Cinnamon help in easing the puffiness and dark circles around the eyes. Euginia Caryophyllata (Clove) Bud Oil*,Cinnamomum Zeylanicum (Cinnamon Bark) Oil*. Coffee Infused Almond Oil–Antioxidants present in coffee fight free radicals. Caffeine is known to help in toning, firming, cell regeneration and cellulite busting. Sweet Almond reduces the damage caused by environmental aggressors, reduces signs of ageing and improves skin’s elasticity. The light oil is easily absorbed and nourishes the skin from within. Green Tea Infused Jojoba Oil-Green is one of nature’s most powerful antioxidants. When applied on skin, green tea provides a much needed boost of anti-oxidants which combat free radicals. Lavender Essential Oil– It has anti-inflammatory, anti-bacterial, anti-fungal and antiseptic properties that help maintain healthy and nourished hands and feet. Its pleasing aroma relaxes and improves mood. Sweet Almond Oil– The oil is rich in fatty acids, Vitamins A, B1, B2, B6 and E for the nourishment of dry, itchy and irritated skin. It is well known for its moisturizing properties and gives the skin a smooth and soft feel with no greasiness. Vitamin E– It reduces inflammation and helps skin look healthy and youthful. It speeds up cell regeneration and helps prevent blemishes, acne and wrinkles. Additional benefits include protection against sun damage and pollutants due to the presence of antioxidants. Cinnamon Essential Oil– It is a warm, spicy oil that helps enhances blood circulation. Rosemary Essential Oil– Itis a powerful anti-septic with anti-bacterial and anti-inflammatory properties. Turmeric Essential Oil– Turmeric is an ancient ingredient popular in India for its skin benefits. It is also widely used as antiseptic, anti-inflammatory, anti-ageing, and skin-brightening benefits. Carrotseed Essential Oil– Carrotseed oil is derived from wild carrots. This pale, yellow oil is rich in carotene and Vitamin A. It is excellent for dry, itchy skin and helps to heal burns. It also acts as a great conditioner for hair and skin and it is an excellent moisturiser for mature skin. Clove Essential Oil– It is an effective antimicrobial, anti-fungal, and antiseptic. It also boosts circulation and provides a stimulating fragrance to products. 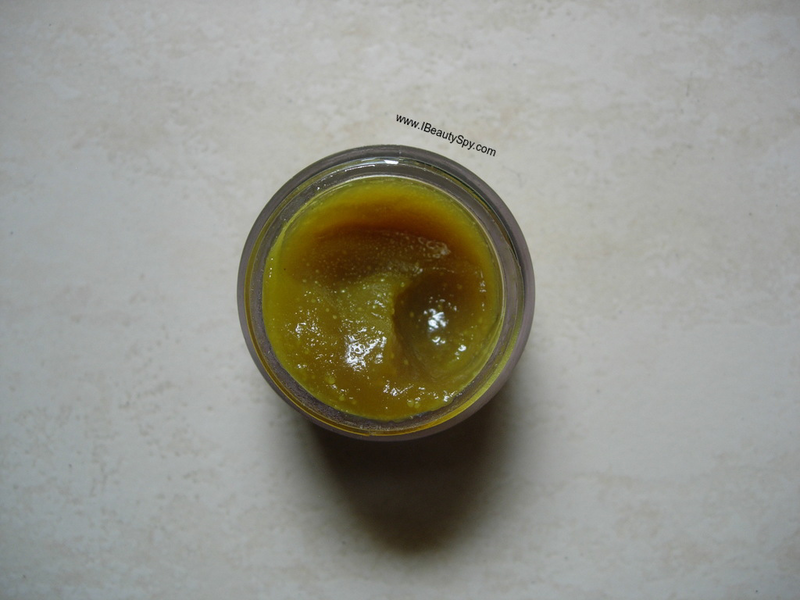 Mango Butter– Mango butter is extracted from the mango seed and it has a very faint aroma of mangoes. It contains many vitamins and minerals that help restore damaged skin. 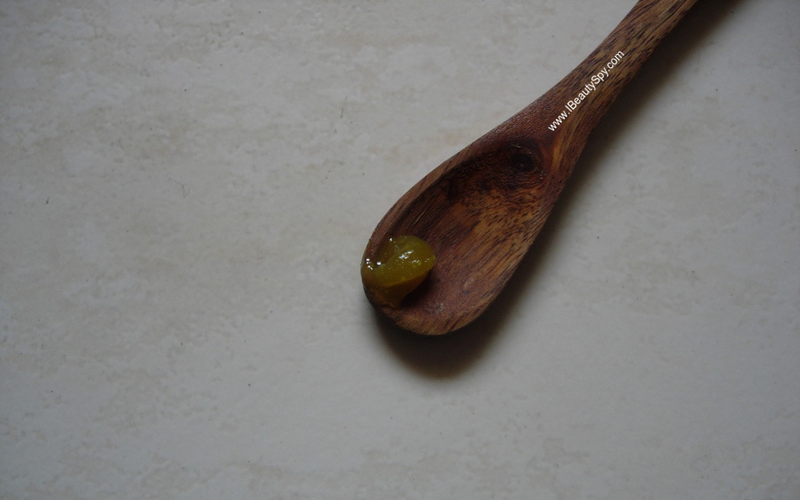 Shea Butter– Shea butter contains oleic acid which is a saturated fatty acid. It mimics the sebum which is naturally produced by our skin. Shea butter is easily absorbed into the skin and it intensely moisturises and provides relief for dry skin. Beeswax – It is a natural anti-inflammatory that soothes the skin and helps prevent premature aging. It also helps protect the tender skin around the eyes from external pollutants. 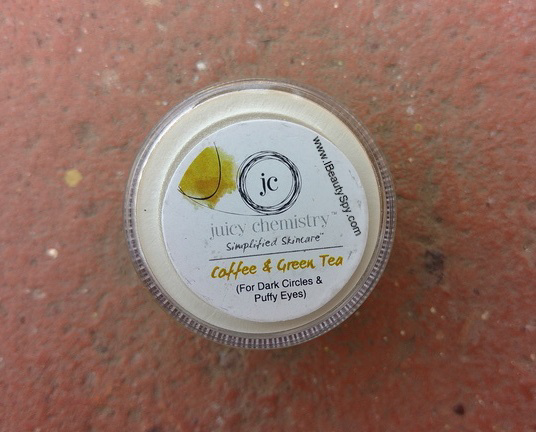 Juicy Chemistry Organic Coffee & Green Tea Eye Cream comes in a tiny tub packaging which looks very cute. Once you open the lid, there is a silver foil covering the tub indicating a fresh, unused product. The brand takes meticulous care in their packaging. When I first saw this cream, I thought it was going to have an invigorating coffee scent or a refreshing green tea scent. But its neither actually. 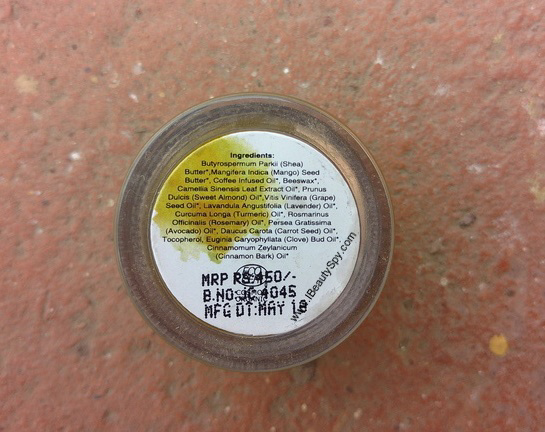 It has a kinda herbal smell, with a mix of turmeric, clove and cinnamon. A warm, spicy scent. It actually feels very relaxing if you like such natural fragrances. The cream looks yellow in color and has a thick buttery-oily consistency. Juicy Chemistry has mentioned to use this eye cream in a very tiny amount as its very concentrated. And I could understand why. I just take a very tiny dot and massage under my eyes with my ring fingers. Trust me, this little massage is one of the things I look forward to most after a hard, tiring day. It gives a very relaxing feeling on applying and I feel like going to sleep immediately. 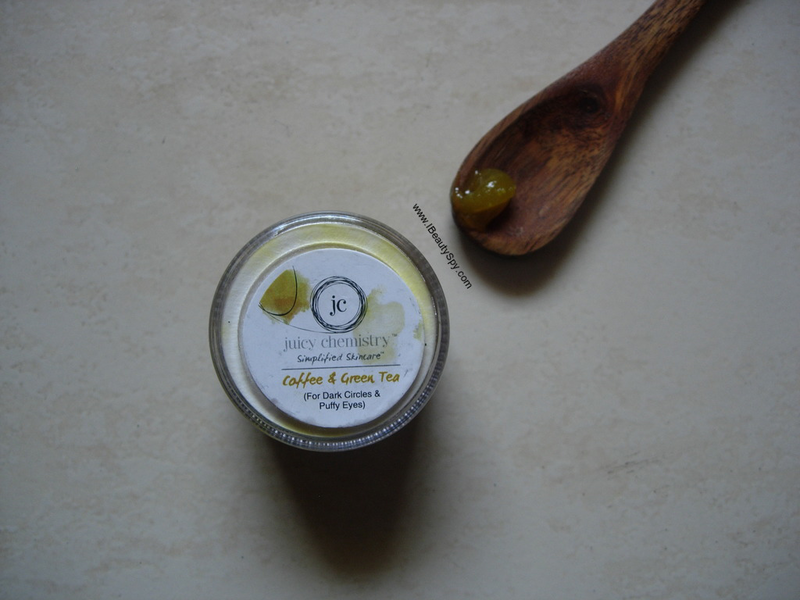 Juicy Chemistry Organic Coffee & Green Tea Eye Cream does give a slight yellowish-tinge to the under eye area due to the presence of turmeric. So I use it only during night. The thick buttery-oily consistency helps in nourishing and moisturizing the under eye area. It has a mix of some of the best oils – avocado, almond, jojoba, grapeseed and vitamin E – along with the best butters – shea butter and mango butter. And we all know how much green tea and coffee are good for the under eye area and dark circles. Due to high concentration of butters, oils and herbs, just tiny amount does its magic. Due to its deep nourishing properties, it also helps in reducing fine lines under the eyes and may work on wrinkles and crow’s feet too. Even if you don’t have fine lines and wrinkles, it can serve as a preventive anti-aging treatment. It reduces puffy eyes to an extent too. I am absolutely in love with the ingredients list of this product. Juicy Chemistry has selected the best combination of ingredients for a eye cream. I haven’t seen this combination of essential oils – carrot seed, turmeric, rosemary, clove, cinnamon and lavender – in any eye care product. You can imagine all the goodness that it is going to work on your eye area. I would definitely recommend giving your eyes some TLC with this caring,, 100% natural, organic product Juicy Chemistry Organic Coffee & Green Tea Eye Cream. * 100% natural, organic ingredients. * Impressive combination of carrier oils, essential oils, butters, coffee and green tea. Unique in an eye care product. * Erases dark circles magically within a matter of 4 days. * Nourishes and moisturizes under eye area. * Reduces and prevents fine lines, wrinkles and crow’s feet. * Relaxes the eye area after a tiring day. * High concentration of ingredients. Yes. Since only tiny amount needed each time, one small tub will last you for a long time. So that’s all for today folks! Hope you enjoyed the review. Meet you in a new post soon! Love your detailed review dear.. nicely written..